MainEventTravel CEO Fraser MacIntyre is among the big stacks at the end of Day 1c of the 888Live London Festival. MacIntyre has 107,600 – just above WSOP hero John Hesp in the chip counts. Hesp bagged up 86,600 last night after a day on the feature table. MainEventTravel is 888Live’s Official Travel Partner for 888Live London offering great hotel deals near Aspers – including the Holiday Inn, Ibis and Westbridge. There’s plenty left on the schedule including today's £10k guarantee Ladies Event. 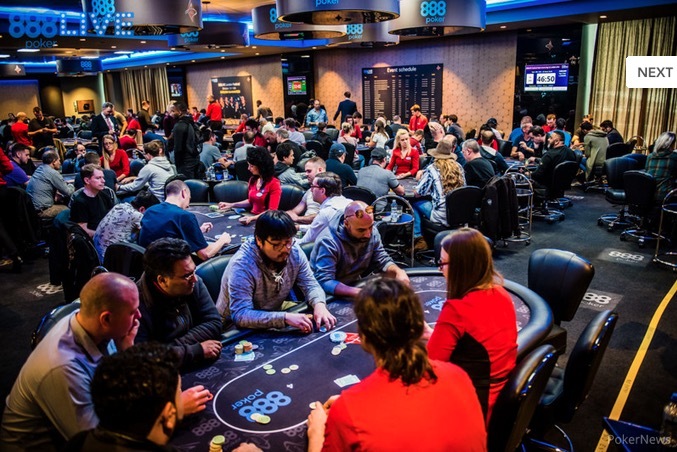 The 888Live London Festival, which features $800,000 in guaranteed prize pools across ten events at Aspers Casino, continues today with Day 2 of the Main Event. Yesterday’s Day 1c drew by far the largest field of the festival with 242 entries packing out the room at Aspers Casino, Westfield. There were 82 Day 1c survivors still chasing some of the monster £400,000 guarantee. The festival is the second 888Live London Festival at Aspers following a debut event last October. MainEventTravel.com has literally dozens of hotel options for the 888Live London Festival – ranging from luxury hotels just a stone’s throw from Aspers through to budget hotels, apartments and hostels in and around the city. Tournaments today include the £110 buy-in, £10,000 GTD “The Whale” and the £55 buy-in, £10,000 GTD Ladies Event. As well as their cash prize, the Ladies event champion will also get a WSOPE ME package. Ambassadors Kara Scott, Natalie Hof and Sofia Lovgren are all out of the Main Event, leaving them free to take part in today’s eagerly-awaited tournament.